After major and minor classes yesterday, students rushed to get ready for their final presentations. The students were all able to show off very impressive work. In only three weeks, students learned how to tell stories and paint images with different forms of poetry and short fiction, and shared samples of their writing with the group. The Speech and Debate classes focussed on how to write and present persuasive and inspiring arguments. The minor class did a short-form debate on whether or not the budgets of arts programs at schools should be completely redirected to fund STEM programs, while the major class did a full debate on whether or not schools should mandate a uniform. Other students, who learned how to use different photographic media to convey messages or feelings with photographs, hung their work all around the walls of our Prep Center. The students in the computer game design class stood beside their laptops and let others walk around to play the games that they created from scratch! Everyone was amazed by the remarkable work of their peers. The four teachers then presented awards to students who demonstrated especially outstanding work over the course of the program. Brian chose Georgia for Creative Writing, Kari chose Assata for Speech and Debate, David chose Ashley for Photography, and Luke chose Burke for Game Design. After receiving their awards and hearing some closing remarks, the whole group watched a video with pictures we took over the course of the entire program. Everyone felt nostalgic and some teared up. Their tears, however, quickly dried when we told the students about our surprise trip to Dockweiler Beach! Students quickly got ready and hopped on a bus that took the group to one of the nicest beaches we’ve visited. We ate pizza on the sand and played games until the sun set. Students’ favorite games were Yee-haw and Wink Murder. We ended our night at the beach by roasting marshmallows over a warm bonfire, putting glow sticks around our wrists, and sharing final laughs and stories. Today, students woke up early to eat breakfast and get ready for their travelling day. As some started to leave, others rushed out of their beds to give each other hugs and say their final goodbyes. The last three weeks with everyone have been amazing! We all learned so much from our teachers and from each other and have made strong bonds with some lifelong friends. All of the students had such an amazing time, and some already began wishfully planning trips to see each other next summer and winter break. Many even shared group photos on Instagram captioning, “I’ll miss you guys, my second family!” We sincerely hope these students stay in touch! They were an irreplaceable group of kids. Check out our final video!! Today, students went on their last field trips with their major classes. Speech and Debate went to the Last Bookstore and Bottega Louie, Creative Writing visited the Margaret Herrick Library, and Game Design received a tour of the Trigger Games headquarters, where they were shown previews of new Snapchat filters not yet available to the public. The Last Bookstore is an airy book and record store offering new and used items in a multilevel space adorned with local art. The Margaret Herrick Library, where the students were able to hold a real Oscar trophy, archives almost all academy nominated and winning scripts, such as the one for Captain America: Civil War. Trigger Game Studios is a company heavily focused on augmented reality (AR) games. They had the chance to speak to members who work closely with Leggo Corp. and those who designed games and movies such as Spiderman and Star Wars: The Last Jedi. After their field trips, students had lunch and paired up to work on their final exhibitions. After reviewing one another’s projects, students enjoyed their evening of outdoor sports complete with three events: capture the flag, soccer, and a final coin scavenger hunt. This activity, along with the Kent Casino Night, Talent Show, and both Quiz Nights, were major game changers. The Gold Team, who used to be down by more than 1,300 Prep Points, won the entire competition at the end of our Sports Night today. To wrap up the day’s activities, the students divided into four teams to search for 250 glowsticks hidden in vending machines, microwaves, underneath tables, and in the laundry room. The winning Gold Team members were able to have one friend on the Blue Team wait in line for them to grab their entrees while they enjoyed their appetizer of soup, fruits, or salad first. Unsurprisingly, these wonderful children had amazing sportsmanship and were content with bragging rights as opposed to another student acting as their waiter for one meal. Their last two prizes were a snack from the “Treasure Chest” and a night trip to Westwood’s Target, Sip Boba Shop, and their favorite: In-N-Out. All students took full advantage of their time today and showed amazing leadership regardless of which Bruin Battles team they were on. They will definitely have a good night’s rest after becoming jaded from today’s schoolwork, sports, scavenger hunts, and nighttime field trip. Today started off on a sad note as we all said our goodbyes to August, who left the program a bit earlier than others. Three students cried, while another student said he was crying on the inside since his tear ducts were dry. The silver lining is that students are looking forward to going home to family soon! Finally, they can give loved ones their presents and share endless stories about their activities. After major and minor classes, we took a stroll down into Westwood Village to buy milk tea with boba, also known as bubble tea. There were mixed reviews about the bubble tea flavors: blueberry, watermelon matcha, jasmine milk tea, and lychee oolong milk tea. They agreed, however, that the texture of boba being both liquid-like and chewy is very unique, and worth trying at least once on their trip in Los Angeles. After boba, students spent thirty minutes around Westwood Village where there were three different UCLA merchandise stores, Target, and Brandy Melville, among other stores. At the end of the night, students played a couple of rounds of Egyptian War, hung out in the hallway on our floor, and checked-in early in preparation for tomorrow’s early start. After students majors, we boarded a short bus ride to Universal Studios, a field trip students said they’ve been “saving money for” this whole month! First, the students enjoyed their Subway sandwiches, tortilla chips with a hint of lime, fig newtons, and extra crispy Trader Joe’s chocolate chip cookies at the picnic area near Universal’s beautiful fountains. Later, the students quickly separated into three groups to rush over to the Walking Dead Haunted House. Many students demonstrated that they were even braver than some of our faculty! After gift shopping and last minute runs to buy soft serve ice cream or Dippin’ Dots, students returned back to campus and rushed to bed to rest for their classes the next morning. After dinner, students did a wonderful job arriving on time for tonight’s guest speaker, the second one and last one of this program. From the Doctor of Law speaker with abundant experience in political science, the students learned a lot about how to detect deceit and respond to lies. More importantly, the students learned how to increase the strength and credibility of their statements when they are trying to converse about something they genuinely believe in or care about. We were so unbelievably happy the students enjoyed the talk and learned lessons they could apply to everyday life. Although the field trip was a tad bit impromptu, today could not have gone better. It was an absolutely incredible Monday to kick off our last week together. 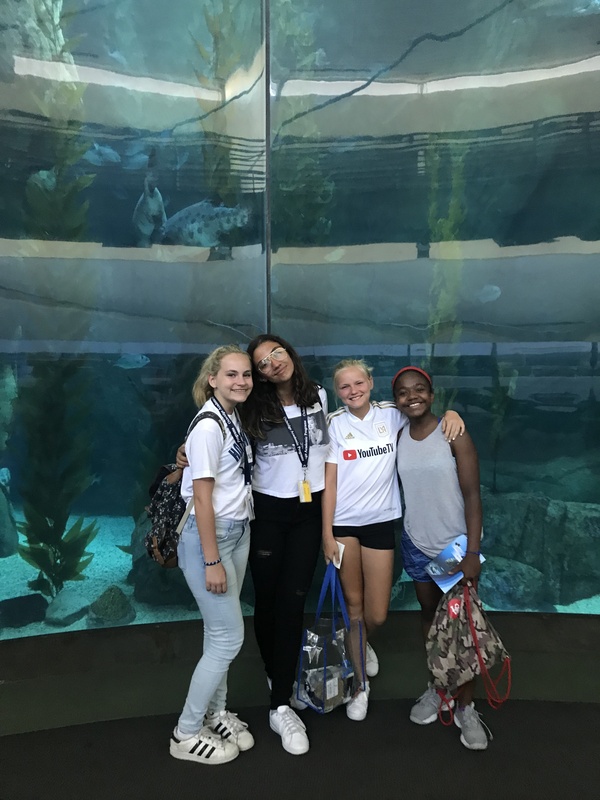 We can tell that the students are cherishing their last days and grateful for the activities we have planned whether it be a trip to the aquarium or a more serious guest speaker for the evening. The students woke up even earlier this morning to have an amazing breakfast before their day at Manhattan Beach. The students loved Manhattan beach and said that it tied with Malibu Beach for first place. As soon as the students arrived at the beach, they asked if they could devour the subway sandwich they chose themselves. Turkey was the most popular, followed by chicken bacon avocado. After lunch and reminders to apply sunscreen and drink plenty of water, almost every student went to enjoy the waves. Most liked ducking under the tides while others linked arms and tried to leap over each wave. Others were happy soaking up the sun’s rays on the shore. After swimming and tanning, students separated into smaller groups to explore the nearby stores. Most visited the shops Starbucks, The Coffee Bean and Tea Leaf, Lemonade and Jamba Juice for drinks while the rest went to Vons to buy snacks. The bus picked us up on time at Vons to take us back to campus. After dinner, students attended their third assembly to talk about their roses, thorns and buds and how they can finish this program on the best note possible. Afterward, they enjoyed popcorn while the Activities Directors checked the cleanliness of their rooms and awarded Charlotte and Salma the tidiest room while Mohammed and Abdulellah came in a close second. At the end of the night, the students joined one another to watch Black Panther, a recent incredibly popular Marvel movie. It seems that our marvelous students are very big Marvel fans. Grand Day at Grand Central Market, Grand Park, and More! Today, we spent our day downtown. We started our day at Grand Central Market: a space packed with all sorts of different restaurants and stores selling anything from authentic mexican cuisine to gourmet peanut butter and jelly sandwiches. The students ate lunch at the market and explored the area in groups before taking the iconic Angels Flight Railway up to a plaza by the Museum of Contemporary Art (MOCA) and The Broad Museum of Art. Walking past beautiful fountains and sculptures, we arrived at the Walt Disney Concert Hall. Immediately, the students fell in love with the interior and exterior architecture of the $265 million concert hall. The lobby design was inspired by nature, because Disney’s wife, Lillian, loved gardens, and the outside, with its sleek golden panels and sharp points, is incomparable to any other building in the city. Fortunately, the “Big Sing,” a choral performance, had spare tickets for our group. We took this opportunity without hesitation to have the best view in the audience. Together, we sang the last two songs – “Dirait-on” and “This Land Is Your Land” – before continuing our excursion. After leaving the concert, we walked to the nearby Grand Park to rest and play for a bit before continuing on to our next destination. Once everyone caught their breath, the group wandered over to Olvera street – “the birthplace of Los Angeles.” This marketplace is home to a wide variety Mexican restaurants, street vendors, and gift shops, and preserves early Californian cultures and customs. We continued our voyage to Union Station, where students admired the old architecture and stopped to get drinks before the bus picked us up to take us back to the campus. After dinner, kids signed up for Wednesday’s talent night and gambled with plastic coins in an exciting Kent tournament.